First Chicago, then the world! What began as a small rock festival in 1991 has ballooned into one of the country’s most commercial and most recognizable urban musical playgrounds. Beginning in 2011, Lollapalooza began extending its global reach into South America, then into Germany, Sweden, and Paris in the years following. 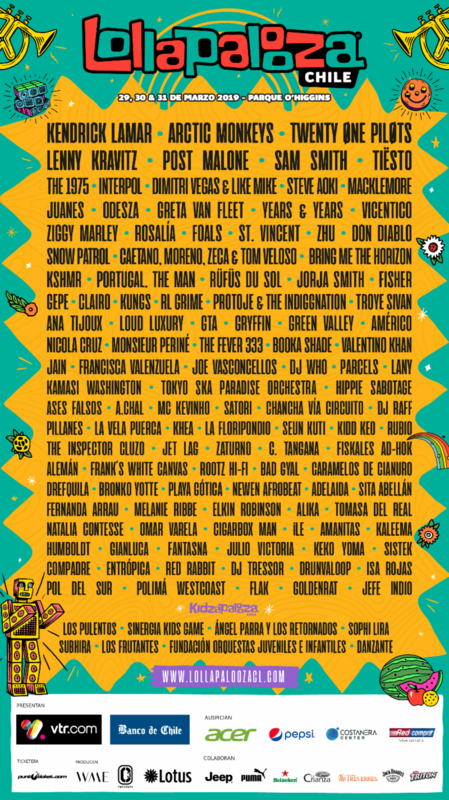 Now the folks behind Lollapalooza have announced line-ups for three of its satellite iterations in Chile, Argentina, and Brazil. 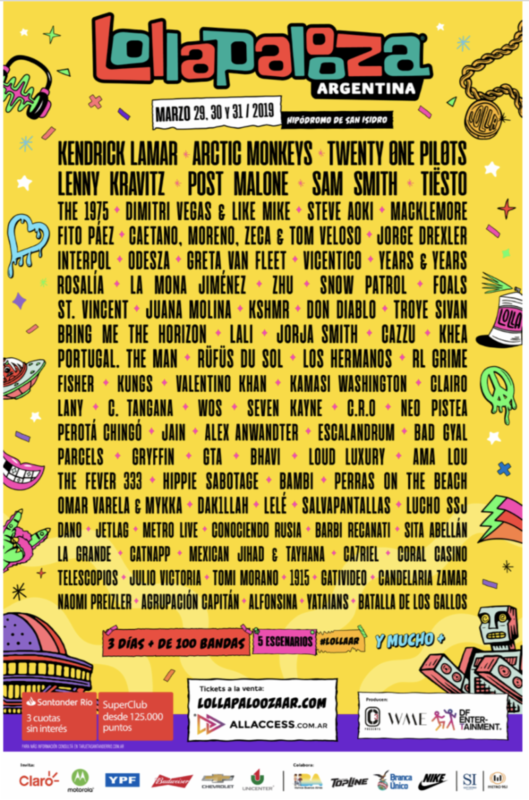 The three Latin American editions will feature an all-star roster of headlining talent in every artist from Kendrick Lamar and Arctic Monkeys, to Twenty One Pilots and Post Malone, to Sam Smith, Lenny Kravitz, and Tiësto. Other artists to the three-day event are Mackelmore, Ziggy Marley, Interpol, Portugal. The Man, and Snow Patrol. Electronic music sees a heavy dose from artists like Dimitri Vegas & Like Mike, Steve Aoki, ODESZA, Don Diablo, ZHU, Rüfüs Du Sol, Fisher, KSHMR, GTA, Gryffin, Hippie Sabotage, and more. 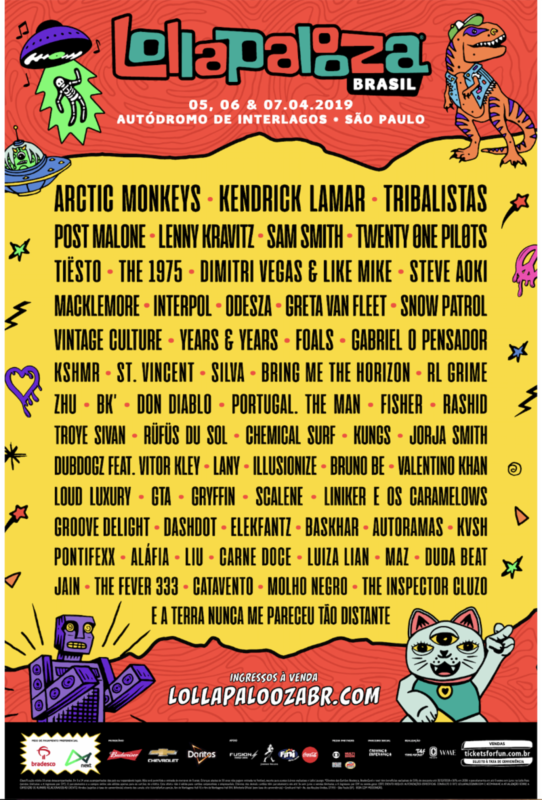 Lollapolooza Chile and Argentina will take place March 29-31, 2019, with Lolla Brazil arriving April 5-7, 2019. Tickets are available to Lollapalooza Chile, Argentina, and Brazil.